Achilles tendon ruptures are a common sports injury that we have to deal with on a regular basis. The majority of Achilles tendon ruptures occur after someone pushes off to start a run, or during high aerobic activity. 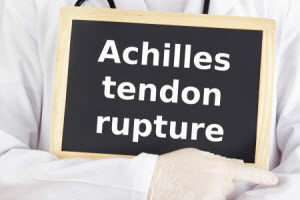 If you suffer an Achilles tendon rupture, there are conservative and surgical approaches to Achilles tendon repairs, although the surgical approach is quicker to heal and decreases the chance of weakness or another rupture, of the tendon, in the future. Traditionally, the surgical incision for an Achilles tendon rupture is very long and has a higher risk of wound healing complications and possible infection. Ryan Howard is an example for how a traditional Achilles tendon rupture can go wrong. He was an All-Star player for the Philadelphia Phillies in 2011. He ruptured his Achilles tendon while playing in the National League Playoffs of that year. He subsequently underwent a traditional Achilles tendon repair, and developed an infection that required additional surgery. Eventually he healed the tendon, but he was out of baseball for almost 6 months after the injury. Here at Foot and Ankle Surgeons, we strive to make you heal as fast and strong as possible. I have seen numerous high school, college, and even a few professional athletes with this injury. We utilize the newest techniques for all Achilles Tendon repairs. We use a new, minimally invasive, technique that allows us to repair the tendon through a very small incision. This approach allows for stronger repair of the Achilles tendon, earlier activity, and significantly less risk for infection. I have my athletes begin physical therapy early, to get them back to their sport earlier, without ever missing a step. If you, or anyone else you know suspects they have an Achilles tendon rupture, give us a call to get them active, earlier!